The discolouration could have been caused by grit being blown upwards by the spacecraft’s thrusters, or by the bullet it fired into the ground. The purpose of the touchdown on asteroid Ryugu was to collect samples of rock for eventual delivery to Earth. Hayabusa-2 arrived at Ryugu in June 2018 after a 3.2 billion km journey. During sample collection, the spacecraft approached the 1km-wide asteroid with an instrument called the sampler horn. On touchdown, a 5g “bullet” made of the metal tantalum was fired into the rocky surface at 300m/s. The spacecraft then ascended to its home position of about 20km distance from the asteroid’s surface. The image is further, visual confirmation that the touchdown proceeded to plan. 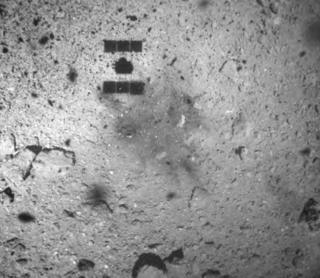 Hayabusa-2 had earlier dropped a small, reflective, beanbag-like “target marker” on to Ryugu. This was used as a guide as the spacecraft descended to the rough surface of the asteroid. The Japanese space agency (Jaxa) had originally planned to carry out the touchdown operation in October last year. But images showed numerous, hefty boulders on the surface, making it more difficult for mission scientists to find a location that was large and flat enough to sample. Controllers had hoped they would have an area of about 100m in diameter to target. But because of Ryugu’s rugged surface features, this had to be reduced to a 6m circle for what team members were describing as a “pinpoint touchdown”. The sampler horn that extends out from the bottom of the spacecraft has a length of 1m. It was therefore vital to choose a landing location devoid of boulders more than 50cm in height, to reduce the likelihood that the body of the spacecraft could hit a rock.